Armed conflicts are currently threatening heritage at scales that seemed inconceivable only a few years ago. Tangible heritage such as landscapes, sites, monuments and artefacts and intangible heritage such as knowledge, languages and traditions are likewise affected. 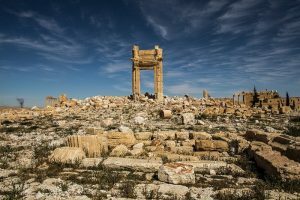 Apart from such obvious threats in conflict zones, heritage elsewhere is often threatened by neglect, decay, or a lack of stakeholder involvement, education, or technical and financial means. Digital technologies provide manifold means for heritage recording, monitoring, analysis and visualisation, as well as for dissemination, education and community involvement. The 2017 annual meeting of the Centre for Digital Heritage will explore these means and their applications to heritage under threat, taking into account that digital data and tools themselves may become part of our (endangered) heritage.